The Background: Recently, Indian PM visited Sri Lanka to ostensibly celebrate the Buddhist Vesak Day Celebrations, which is commemorated by millions the world over to mark the birth of Buddha in 623 BC, the day he attained enlightenment and also the day he left this world in his 80th year. However, his visit has noteworthy political connotations as well in view of some recent developments in the foreign policy of Sri Lanka. Prior to this, since 2015, Sri Lankan PM, Ranil Wickremsinghe has visited India thrice and so has Sri Lankan President Srisena. In fact, Indian PM has also now visited Sri Lanka twice during the last 3 years. Relations with China in the immediate past: The previous Rajapakse government in Sri Lanka had much closer relations with China in the recent past, and China was known to supply arms as well as provide huge loans to Sri Lanka for its development. To shake up India, in 2014, Sri Lanka even allowed docking of a Chinese submarine in Colombo harbor. Since Sri Lanka is only half an hour away by sea and only a few seconds by air from India, this development did send alarm bells to India. China also invested sufficiently in the infrastructure of Sri Lanka, which included building of Colombo international container terminal by China Harbor Corporation. Therefore, during the regime of the previous government in Sri Lanka, China could make her presence visible in Sri Lanka. Even today, Sri Lanka considers China a friend, since China provided equipment and weapons to Sri Lanka even when there was an official arms embargo. However, in the recent past, Sri Lankan government has become conscious of Chinese military interest in making Sri Lanka a forward base to aim India and gain more strategic influence in the region. Recent Developments: Clearly, while previous Rajapakse government in Sri Lanka preferred to deal more with China, the present government now considers equally significant to have good relations with India. At the leadership level relations are quite cordial, but they have to be translated into action and presently there is some rebalancing in Sri Lanka. The present government feels that after the conflict in Sri Lanka, even though India had a development portfolio of over $ 2.6 billion, built 50,000 houses and railway tracks, some people in Sri Lanka thought India was only helping Tamils in North Sri Lanka. 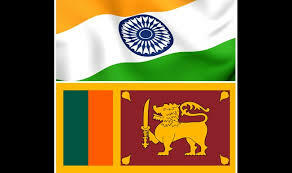 India’s efforts did not receive adequate publicity, which led to certain misunderstandings among Sri Lankan population. Now, the new Sri Lankan government wants that some Indian companies build Colombo Port’s East Terminals after China’s earlier effort in this region. On the other hand, Sri Lankan government needs to initiate adequate steps to rehabilitate displaced Tamils, who are still in India after the earlier conflict in Sri Lanka. It has been reported that recently, Sri Lanka refused permission to China to dock its submarine in Colombo port, which has been well appreciated in India. During his recent visit to Sri Lanka, Indian PM also inaugurated a 150 bed-hospital built with Indian assistance and also interacted with Indian origin Tamil tea workers. The Sri Lanka government feels that there is a need to have more cultural and religious interactions between the people of two countries to build more trust and faith. Conclusion: India has been for long Sri Lanka’s biggest trade partner and has played a significant role in rebuilding Sri Lanka. Since India cannot match China’s economic power, India needs to focus on its traditional values of Buddhism and Ramayan to improve relations with Sri Lanka. At the same time, India can supply electricity to Sri Lanka and further improve its trade and economic relations by introducing easier visa norms etc. There is an urgent need to start ferry services between India and Sri Lanka to improve people to people linkages. Finally, India needs Sri Lanka strategically as well, to ensure security in her neighborhood.